The central symbol makes a clear reference to the traditional symbol of St. George, a red cross on white, differenced by the addition of the split maple leaves, indicating the Society's position as the premier organization dedicated to St. George in Canada. This is the first time maple leaves have been used in this way, and they were inspired in part by the armorial bearings of the St. George's Society of New York. The use of St. George habited as a late medieval knight is easily recognizable in Western art. Here he is holding several floral symbols: the red maple leaf of Canada, the white trillium of Ontario, and white and red roses, which refer not only to England but to Toronto (the white rose is associated with York, the early 19th-century name of Toronto) and the Red Rose Ball, a major social event held by the Society. 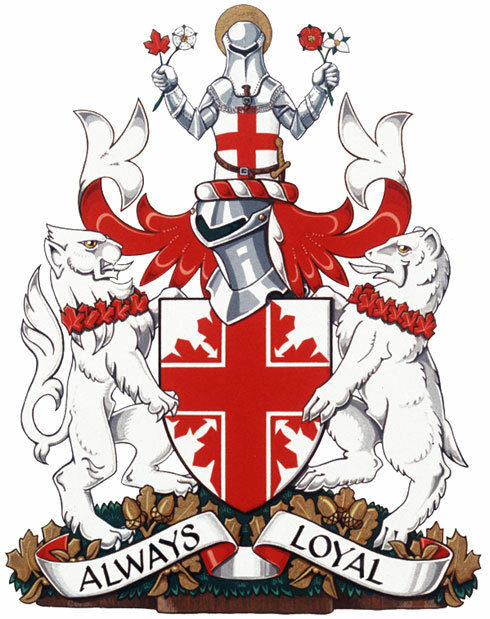 The lion makes a reference to England, and the bear is based on one of the supporters of the arms of the City of Toronto, and is thus a local reference. Their collars of maple leaves repeat the symbolism of the arms. The oak leaves, acorns, and maple seeds on the ground further combine Canadian and English symbolism, with indications of renewal. This phrase was chosen by the Society as a statement of enduring fidelity to its roots.